This is currently the second active band called Lovebites (that we know of), but at least they’re easy to distinguish from the similarly-named Japanese power-metallers. This lot is comprised of former members of Sharks, Foes and Octane OK, bands that could (and in some cases, should) have achieved much more than they ultimately did, but have now regrouped for something ingrained in punk spirit, and executed with the vintage veneer of classic rock ‘n’ roll. Between that and the overarching theme of the ills of social media, these four tracks paint an image of a band unburdened by any contemporary trimmings, and become more reliant on the tried-and-true method of good songs and standout performances. And while they’re definitely close to both of those things, Social Hell feels a bit too abbreviated and underdeveloped to fully hit those higher ends. The warmth and jangle to the guitars is a nice touch, and Jack Perry has the vocal prowess to carry the cantering lilt of these songs, but while Lovebites are clearly pulling from bands like The Menzingers or The Gaslight Anthem sonically, there needs to be some instance of rugged grit in at least one of these areas to avoid falling flat. The framework laid out on tracks like Duppy and Just Fail is solid, but without that extra push, Lovebites don’t quite hit their mark. That said, that framework is a good start, and in terms of an overall vision, Lovebites’ is clearer than most. There’s a melodic approachability that’s worth pointing out, landing somewhere between classic power-pop and ‘90s indie-rock in execution, and gelling exceptionally well with the earnest sensibilities of a track like Tick Along. It’s not groundbreaking but it’s still a core of considerable strength to build on, and with it being the constant variable across all four of these tracks, it’ll likely end up being the key feature in Lovebites’ arsenal. That’s ultimately projecting though; right now, Lovebites come across as a competent if unseasoned addition to a burgeoning British punk scene that only look to be going up in future. As a debut, Social Hell sets down all the groundwork it needs to without fully breaking the bank, and right now, that’s fine. The shortcomings never provide too much of a hindrance, and it’s at least an EP that faithfully gives the impression that the band will only get better. 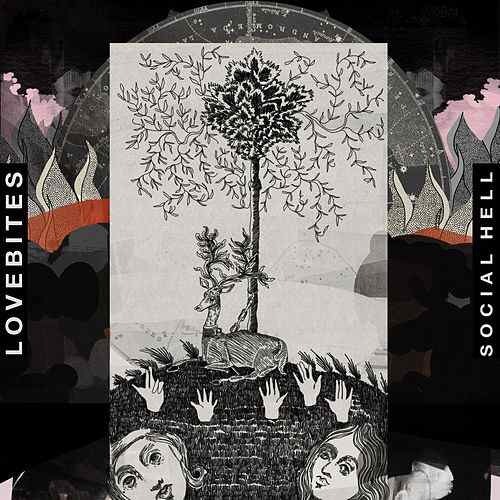 ‘Social Hell’ by Lovebites (UK) is released on 20th July on Sabbath City Records.